How are suffering and joy connected? What is the purpose of suffering? How can God who is good allow us to suffer? How can we transcend suffering? Our world view tends to dictate our response to suffering. No matter how we try to answer these questions one thing is for certain. We realize that suffering is a mystery. And this mystery has the power to transform us. For persons of faith, we know that suffering can be turned into joy. Our greatest example is Jesus Christ who endured a horrific torture leading to death on a cross but was resurrected on the third day to bring salvation to the world. How can one not rejoice in that? So one can say that the purpose of suffering is to bring us joy. One can also gain understanding, knowledge, wisdom, and hope through suffering. Suffering can increase virtues such as fortitude, humility, faith, hope, trust, etc. that would not be as easily attainable when one is not under a challenge and is in a state of complacency. In a perfect world there would be no need for suffering but since we don’t live in a perfect world, we enter into suffering to exit in a more perfect state. Some ways to transcend suffering include “desert time” such as during the season of Lent. Depriving oneself of worldly pleasures, sacrificing and being of service to others, journeying with others in their sufferings, etc. — all of these help bring us to spiritual maturity and are of great benefit. Joining our sufferings to those of Christ on the Cross help us to see those sufferings in a new light with a renewed sense of purpose and hope. So even though suffering is a mystery, we know that there is much to be gained through it. So rejoice and be glad for your sufferings. I pray that your Lenten desert time has brought you to a new level of understanding, knowledge, wisdom, hope, and joy! 1. St. Francis of Assisi by Thomas of Celano, Franciscan Herald Press, Chicago 9, Illinois, 1963, p. 254. 2. The Little Flowers of St Francis, The “Fioretti”, edited by the Franciscan Father Zeffirino Lazzeri, Giulio Giannini & Son, Publishers, Florence, Italy, pp 44, 46. 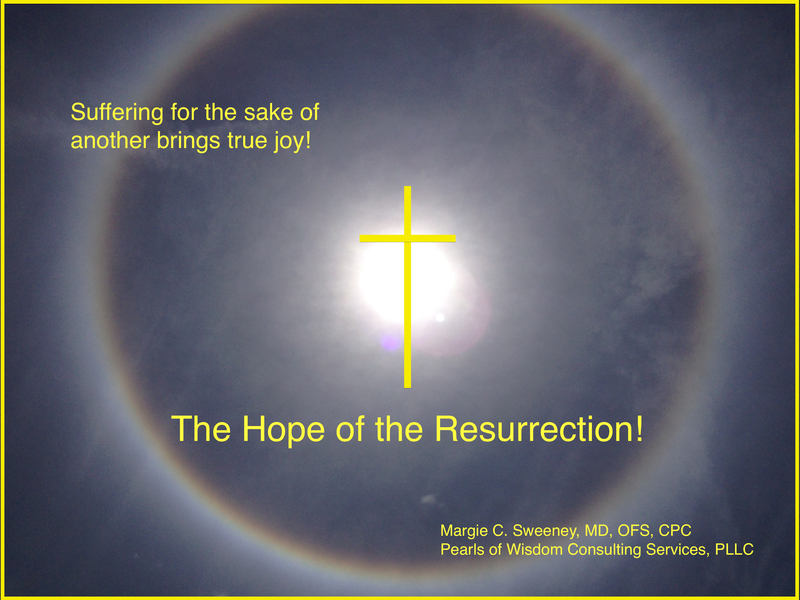 You are currently browsing the Pearls of Wisdom Consulting Services blog archives for April, 2014.